I am a big fan of your site, and thought you would like me to tell you about the miraculous healing God wrought in the life of my pet cat. Her opinion was that it looked rather odd, but was probably not anything too serious. She said I should take the cat to the vet to make sure. As soon as Mimi was out of the carrier, I could see that my vet, Dr. Ronis, saw that this was something very serious. As she felt the cat's neck, she said that it was probably cancer -- a certain form of lymphoma (I WISH I could remember which kind), but that there was a very remote possibility that it wasn't. And as the cat couldn't eat... I told her to her great surprise that Mimi WAS still eating. In any case, a biopsy was needed. When the biopsy came back, it confirmed that it was cancer and very advanced -- the cat had only a few more weeks to live. Dr. Ronis told me to call her when I'd made a decision. Kathy came by to pray over Mimi, which I thought was a kindness, but I wasn't expecting anything. My idea was to hold off any decision until Mimi stopped eating. Turns out there was no decision needed. The lumps disappeared COMPLETELY, her voice returned to its normal ear-piercing shriek (her full name is Screaming Mimi), and she again took up her wake-up call responsibilities, for which her voice is ideally suited. Then in August, my oldest cat, Daisy, got an absess in her mouth and I returned to the vet. As Dr. Ronis was looking at the chart, she pointed and said, "Oh, Mimi..." I could tell she wanted to know when Mimi had died. When I told her that Mimi was still alive, the lumps were gone and she is as healthy as she ever was, the vet was FLOORED. I believe the only reason Daisy got an abscess was for me to return to the vet and tell her about Mimi's miraculous recovery. For anyone who might be reading this: Don't let anybody tell you God isn't interested in animals. 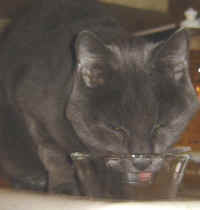 Above is a photo of Mimi enjoying last night's supper (1 Dec 2005).